You read our tips on starting an in-depth, Socratic-style discussion with your teens and decided to give it a whirl. Meanwhile, you’ve got a two year old in the bathroom diligently unwinding an entire roll of toilet paper. Today, we’re sharing the first in a series of tips called Engaging Your Littlest Learners—easy ways to keep little ones happy while the big ones do school work, using items you’ve probably already got on hand! 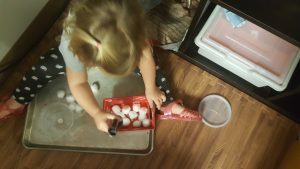 This month, students in Regina Mater’s Little Kingdom (ages 0-3 years old) are practicing the use of tongs to move “snowballs.” Snowballs in Texas? Cotton balls make a simple, mess-free substitute as part of our winter theme. This is a great fine motor activity that has so many benefits. Because it strengthens the same hand muscles used in writing and cutting, using tongs is a great pre-writing and pre-scissors activity for toddlers and very young children. The activity, inspired by the Montessori method we use in Regina Mater’s Mariengarten classroom, works on eye-hand coordination, manipulation and grip strength, concentration, and pure enjoyment! First, demonstrate the activity while your young child watches. Try not to explain what you are doing using words. Invite the child to imitate your movements. At this young age, free play is paramount, so don’t be surprised if the child’s imagination takes the activity in a new direction! For more tips on creating the home environment, read Montessori in the Home.